I always thought I’d have a great little library for my kids. You know – the book shelf that is filled with great colored spines. Books that are tall and proud. Books that share the classics, the standards, interspersed with books that share my love of art, of the tangible, of the world. As an “ahem,” educated person, I’m supposed to be modeling my UNWAVERING LOVE OF READING with my little people. Good, beautiful books. Ones that we read over and over, ones that we all sit down and savor together. After H was born, I did what a “good” parent does. Every day we’d pull out his board books. He’d chew on them, and I’d try and read them. Later on, I’d sit in a rocking chair while he turned pages faster than I could even tell what was on the page. Then he’d whine and complain and squirm off of my lap. Not that I was giving him the Best reading material. Big Beautiful Tall Books are Expensive. Our book collection was mostly finds from Garage Sales and Goodwill. 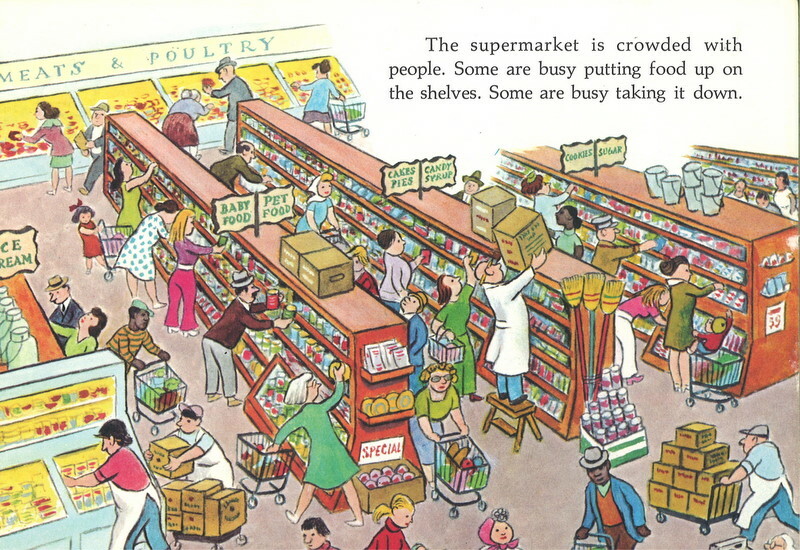 Read – most of our books were (are) pre-broken in, dingy and a bit old. Some not even current titles. Some you can only find in antique book collections. Some that never should have made it to the Garage Sale. You see, (oh, am I admitting this now to the general world? ), I don’t really read fiction books. This one reality has caused MUCH anxiety in my life. If I don’t “read” books, will my kids? Will they grow up to love the written word? Will I be shunned as a bad parent? For Heaven’s sakes, will they be LITERATE? My mom is a voracious reader, and as a kid, I loved a good book. I read through the middle school paper back collection in my first year in that building. I worked at a bookstore for several years. It’s not that i don’t like reading. Given enough time and a nice long vacation on a beach or with a lot of train time and no children, I’m sure to finish a good solid fiction book. But here is the thing – I do read. I skim non-fiction books from the library. I read magazines about art, architecture, and home living. I read sewing patterns and recipes in cookbooks and then follow their directions or sometimes make up my own. I read email, Facebook, blogs, and the newspaper online. I read out loud funny and ridiculous letters to the editor in my Food Coop’s Reader (gotta get a good laugh over the folks that complain about the Oatscream Machine being broken down). I read travel books. I read the signs at the zoo, and the menu at the bakery. I read signs on the street during our walks and bike rides. I read directions to the museum, and the little wall cards that describe the crazy art that we’re viewing. I read the bus map, and the calendar when trying to schedule fun things for our family to do. 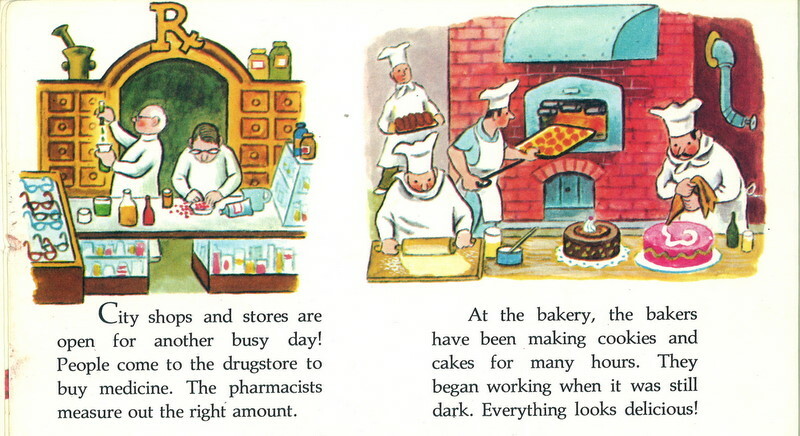 So it shouldn’t be a surprise to me – or to any of you – that my FAVORITE kids book – one that I will read over and over and over – is an old copy of Busy Day Busy People by Tibor Gergely that I picked up at the Dig and Save. Ah, Busy Day Busy People might be the best book of all time. Page by Page, the book describes the life of busy people from sun up to sun down. 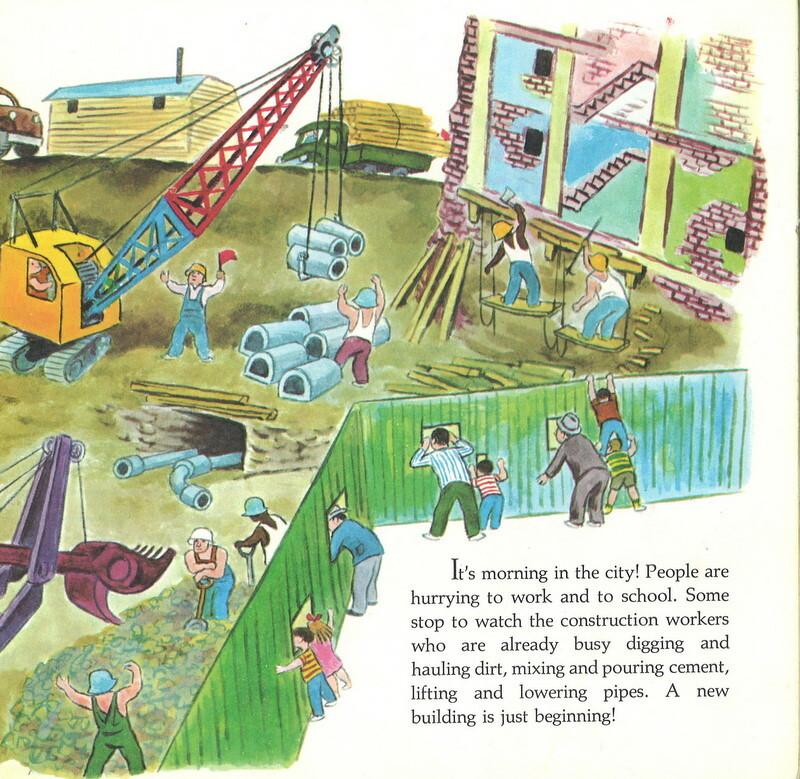 As people are waking, bakers are baking, and construction workers are hauling dirt. People go to work, go to the doctor. People are taking public transportation and going out to eat, and news reporters are delivering the stories of the day while families regather at the end of the day. The other day my husband and I were reviewing our shared Google calendars via Google chat (we were both at work). He was going here, I was going there. He’d pick up the kids from daycare, I’d be home in time to swoop them up for lessons or a playdate of some sort while he went to the gym. Then he’d come back home in time for me to meet some friends and then go grab some coffee while I worked for a few more hours and he put the kids to bed and did some needed chores around the house. At the end of the chat, he said (ok, chatted) “Are we too busy?” It’s a question we get frequently, and something we talk through alot, just to make sure. But the thing is – We aren’t. Our family likes to go, do, be. If we could be in the middle of it all, every night in the city, we would. And on my days off I’d drive to the country and enjoy the trees, and then head back for some delicious food and an art show on a street where people bustle past midnight. Or maybe I’d choose an evening on the lake with the kids looking at the stars and pointing out constellations, while inhaling enormous smores or counting fireflies. The world is big, and we want to explore. Some folks are happy laying low, living quiet in the trees. We like to visit them on the weekends. Every person, every parent, every family has to figure out what makes them Go. I think about that book often, how every page, every person resonates somewhere deep inside my bones, my decisions. It resonates in the spot that I suppose Walden and stacks of novels do for others. And at the end of our chat that day, my husband wrote to me “Busy Day, Busy People!” I just smile and laughed. Impressed that he ended our conversation with a literary reference. Searching specifically for this book for , I guess, nostalgia reasons, I stumbled across your blog entry about it. I’ve already e-mailed the link to it to my Mom, thanking her for reading to me as much as she did when I was a kid. Thanks, Ken! 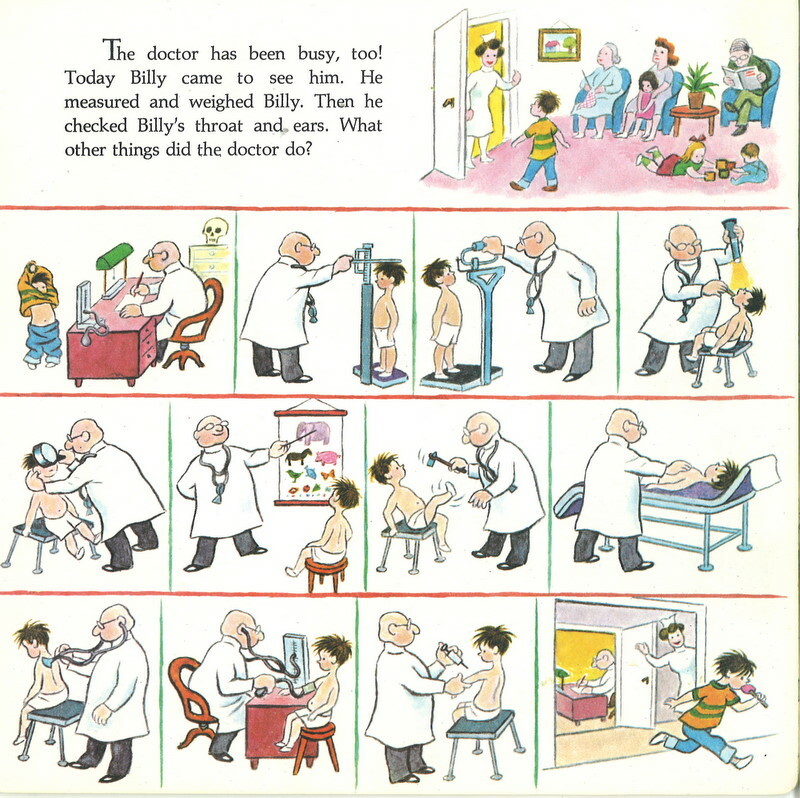 I discovered a copy at my daughter’s preschool and was so excited. 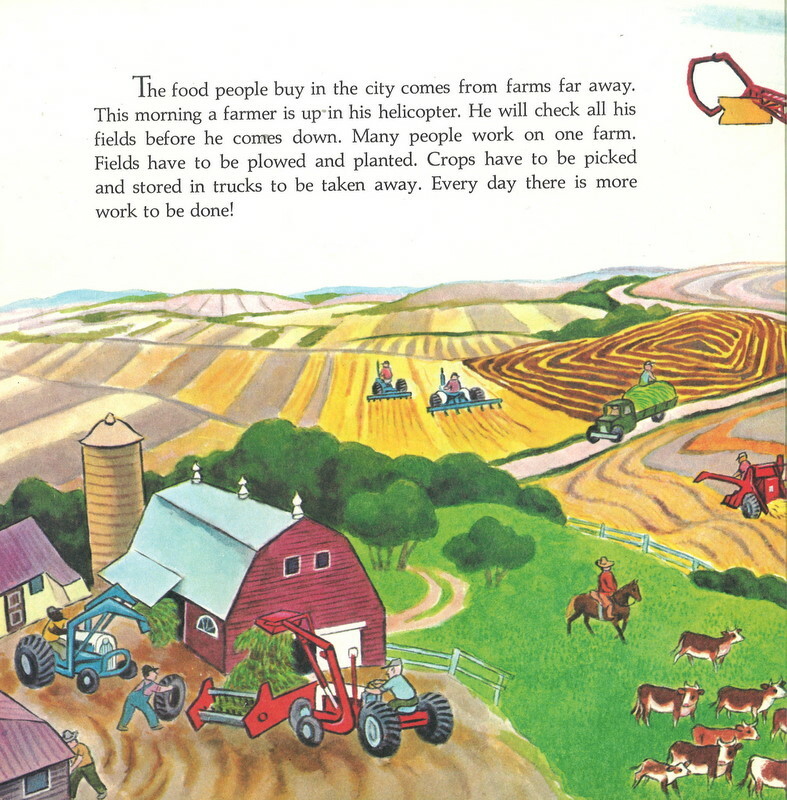 I picked our worn copy of this book, “Busy Day Busy People” to read to Abigail’s 1st G class. It was an awesome parent moment when I re-found this among 30ish kids books that went from my childhood shelf to my 1st sister’s kids to 2nd sister and finally back to my daughter’s shelf. The anachronisms in the pages prompted excellent queries from by high Autism Spectrum daughter. Thanks, Kirk. I’ve been on the lookout for a copy for our family, too. I would love to see the images blown up largely – what fun wallpaper!